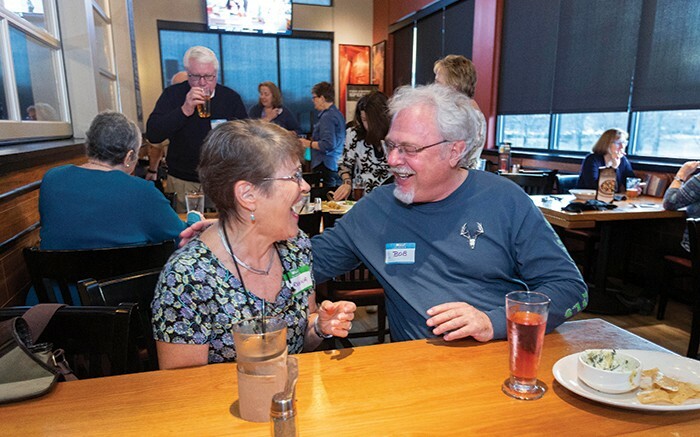 Mary Witt, in red sweater, socializes at a recent Silver Connections event held at BJ’s Restaurant & Brewhouse in Cary. After moving to the Triangle, Witt joined the group in order to meet people her own age. When a young couple smiles lovingly at each other and declares, “’Til death do us part,” they are focused on the ‘happily ever after’ hopes they have for their future. That’s how it was for Cary resident Mary Witt when she married her husband Larry. For 34 years, theirs was a marriage filled with laughter, friends and the adventures of raising two children. But it ended suddenly when Larry died of cancer 10 years ago. Mary Witt was 56 years old. Once “til death do us part” arrived, Witt felt instantly old. She changed jobs, took a Spanish class, traveled some — but she discovered traveling alone was just no fun. Nothing was making her happy. “I was flunking widowhood,” she said matter-of-factly. Determined to give it one more try, Witt took a job transfer that moved her from Connecticut to Cary. In the Triangle, she discovered what was missing. 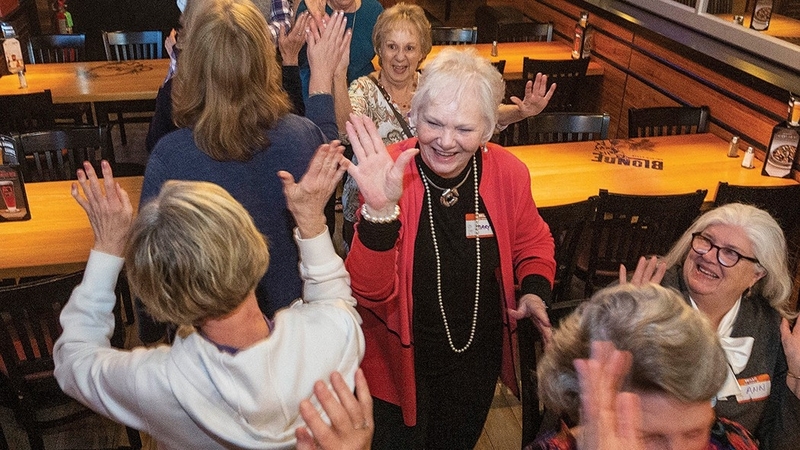 “Socializing is a must for those 55-plus.” Laura Kay House recites the motto at the heart of the Triangle company she founded in 2007. 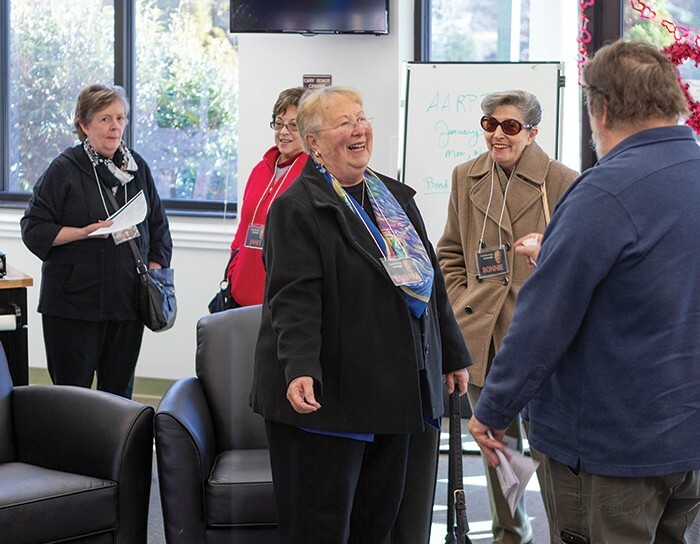 Silver Connections is a senior member service that connects folks 55 and older to meet, mingle and enjoy unique events together. 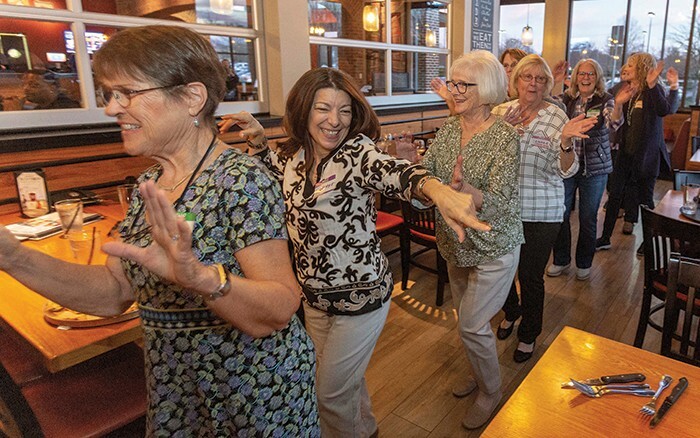 There are about 10 Silver Connections events a month, everything from Bunco games and museum outings to mixers at local restaurants, like this one held at BJ’s Restaurant & Brewhouse in Cary. When House started the group, she wasn’t a senior herself but had developed a compassion for older people at a young age. With a master’s degree in gerontology, she had also studied the feelings of isolation that can come with aging. “I saw a lack of opportunity out there and a niche that needed to be filled for people 55 and older to meet and enjoy activities together, that wasn’t a dating service,” said House. Regina Alexander and Bob Clarke chat over beer and appetizers. She plans about 10 Silver Connections events a month, everything from supper clubs, Bunco games and wine tastings to theater, museum outings and even overseas travel. Members pay a $250-$300 yearly fee and can attend as many or as few events as they like. The group is capped at 150 members, and House meets with each potential member to make sure the group will be a good fit. 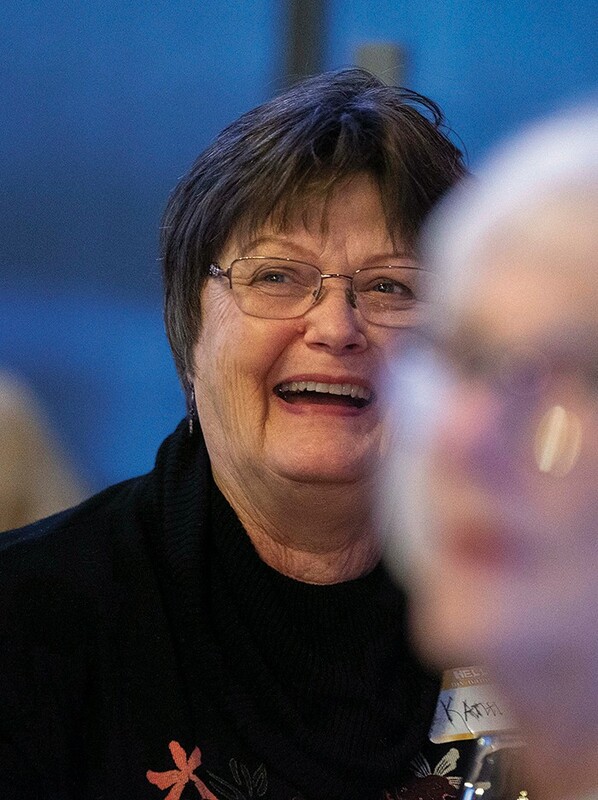 Kathi Smith says she has developed friendships with a group of people who share interests and histories, none of whom she would have met without Silver Connections. Before she joined, Witt wanted to make sure there would be a group of people close to her age and activity level. “The hardest part is making it from the car door to the front door of the activity,” Witt said. After forcing herself over that first hurdle, a new world opened up to her. She attends three to four activities a month and has a close group of single friends — men and women — with whom she frequently travels. “Starting friendships later in life is more rewarding than I ever expected. We have so much fun!” Witt said. 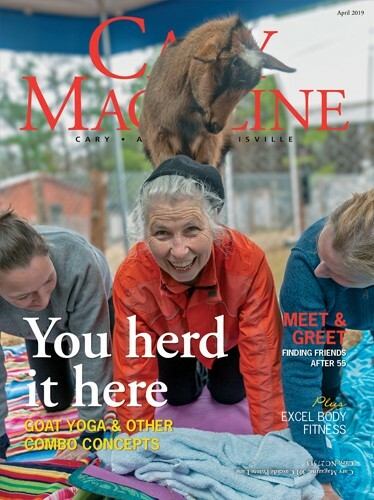 As a divorcee, 72-year-old Kathi Smith arrived at Silver Connections from a different place but says the decision to “put herself out there” has been life-changing. She has developed friendships she wouldn’t have otherwise with a group of people who share similar interests and similar histories. “Life can be very lonely, but it doesn’t have to be,” she said. Witt and Smith report their newfound social life has improved their physical, mental and emotional health. That falls in line with nearly 150 research studies which show people with stronger social relationships are 50 percent more likely to live longer. Barbara Holmes, center, Bonnie Carson, right, and Cheryl Simon, far left, chat before they leave for an outing at the N.C. Symphony. Commonly cited benefits of friendship include a stronger immune system, lower stress, improved self-confidence and increased happiness. Conversely, those who are lonely with weak social connections are more likely to suffer from depression, cognitive decline and delayed recovery from illnesses. Smith likes to say it’s not just children who need a village; seniors need a village too. Fortunately, there are several options in Western Wake County for seniors to find their village. When Smith isn’t socializing with her Silver Connections friends, you might find her at the Cary Senior Center taking an art class. The Town of Cary’s gem continues to shine by offering seniors more than 150 classes, outings and special activities each season. The Cary Newcomer’s Club and Apex Newcomer’s Club are other social organizations that organize more than 20 activities every month. While not exclusively for seniors, the newcomer’s clubs do offer an opportunity to make new friends, share common interests and do charitable work in a social setting. 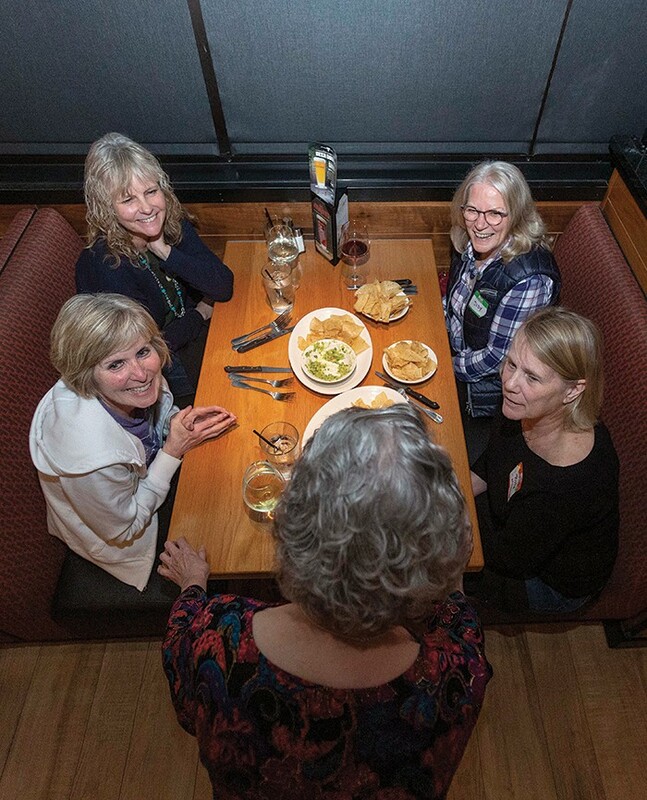 In short, whether you are looking for a packed social calendar, a weekly class or a monthly outing, Western Wake has something to offer for any senior who is ready to embrace the next phase of life. Cathy Gordon, right, waits with friends Karen and Edward Wasick before the group boards a bus to see a performance at the N.C. Symphony. 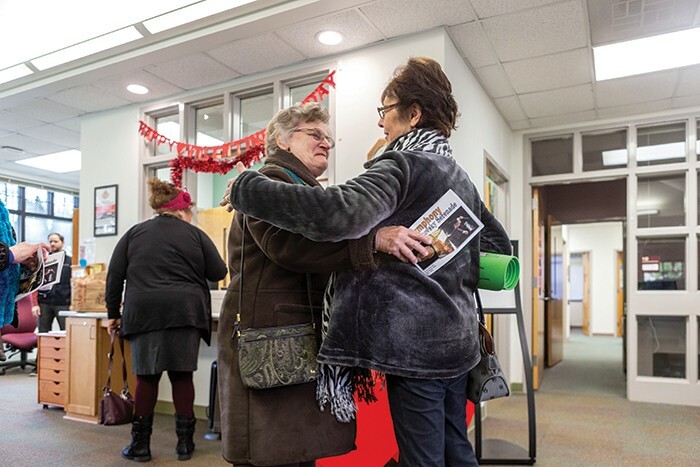 Terry Reichel, left, hugs Pat Connolly at the Cary Senior Center. The center offers more than 150 classes, outings and special activities every season. 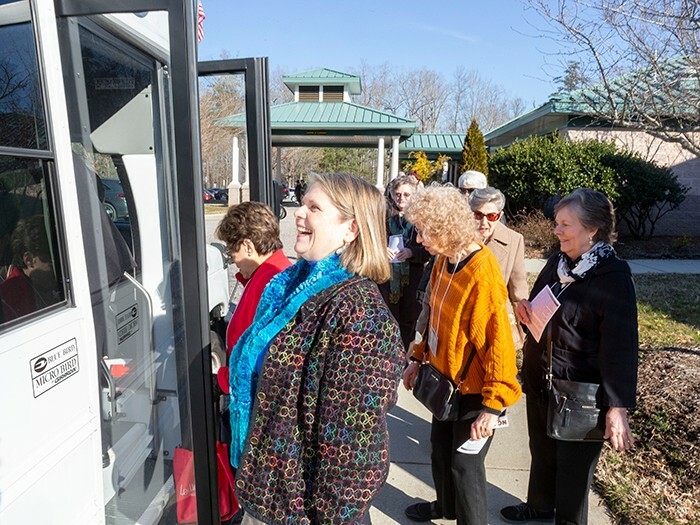 Jenean Todd, Cary Senior Center trips and outreach coordinator, laughs with seniors as they board a bus heading to Raleigh for a N.C. Symphony concert and lunch at Tupelo Honey. Other outings organized by senior center staff include a train trip to Selma, N.C., and an Ava Gardner-inspired tour of Smithfield, N.C.